This topic contains 6 replies, has 5 voices, and was last updated by Steve Orlebeke 7 months, 1 week ago. I have one through-deck air vent leaking. Occluding the opening with duct tape has temporarily solved the problem of drips onto the forward saloon seat but how to cure the problem long term? I would prefer a Dorade substitute but like to remove the cockpit/ deckhouse roof and position this on deck over the vent so a Dorade would probably preclude that arrangement. The vent has a vertical tube sealed where it passes through the deck, and a canopy covering tube and baffles. The canopy or roof seems glued to the deck. Anybody dismantled one of these things? Anybody have experience of alternatives? I have only considered this problem arising but am aware of another nice 38, whose owner describes a similar leak. Think I would try removal using a flat paint scraper, with perhaps some gentle tapping to help work it loose. Would involve more work, trying to cut them off. Hopefully, if the adhesive is failing, they will come off ok. Would be interested to learn how you get on? Yes, the foc’s’le one leaked horribly two years ago, and was taped over for the last part of the season. I knocked it off with a wood chisel, bit by bit around the edge. it was attached with polyester putty which was quite brittle, and the underlying gel coat did not chip. It was a bit disconcerting hitting it hard, but worked out well. 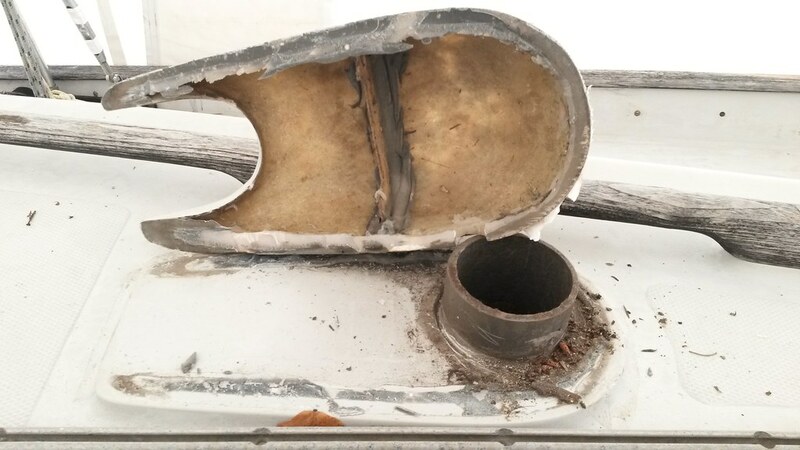 the baffle was also connected with this putty and was disconnected on one side, perhaps from hitting it, so needed repair. Great info and pics, much appreciated. We had leaky vents and figured out how to get them off as described above. The standpipes underneath were all broken loose from brittle glue. So water goes between the pipe and the deck. We pulled the tubes out, cleaned them up, and reinstalled with 3M 4200. Then bonded the covers back down with the same. No more leaks.